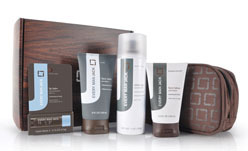 Every Man Jack is a company that sells all kinds of men's hair, body, skin, and shave products. Since my husband loves to try new products like this, I contacted the company and they agreed to the review and giveaway. My husband chose the thickening grooming cream, face scrub, and shave gel to try. His opinion: he loved them! He said that the thickening cream left his hair not too greasy (which I guess is a common problem in mens hair products). The face scrub smells good and leaves his face feeling clean after a long days work. These products are sold at Target and other grocery stores around the country. They are affordable for every one which is a huge plus. Here is some information about the company: The idea was simple. There should be high-quality grooming stuff made just for guys that didn’t cost an arm and a leg. Products that are honest and straightforward and stripped of all the things you don’t need, like harsh chemicals and unbelievable promises. Guys would buy our stuff and they’d like our stuff and maybe even tell a few friends. And so we’d come up with more products. Guys would have a brand they could count on from head to toe. And it’d be time for their stuff to take its rightful place in the bathroom. Every Man Jack Giveaway Prize! I would like to get the face lotion for my man. He needs to take care of his skin since he spends so much time in the sun. my man needs a grooming kit - but basically because I'm too cheap to buy him anything. It's made a great christmas gift, don't you think? I would like to try Every Man Jack's Thickening Grooming Cream. I follow your blog on GFC, subscribe to your email and like you on Facebook! I would love to win this for my husband! I think he would like the cedarwood body wash! Thanks so much for the terrific giveaway! I would like the got the hair thickening shampoo and conditioner for my hubby. Thanks foe the chance to win! I would like for my husband to try the body wash | citrus scrub. I would like for my husband to try the Cedarwood bodywash. my boyfriend would love to try the body bars! My son would love this gift. My husband would love to try the face scrub | signature mint. I'd love to win this for my bf! I would like the face lotion sun protection for my boyfriend. He tends to neglect his skin. I would like my husband to try the Cedarwood Body Bar. I most want my husband to try the sun protection kit. Being in "sunny" California, skin protection is a major issue! The Body scrub would be great for my hubby. Thank you for a great contest! I would also like my boyfriend to try the body bars citrus scrub. The hair thickening grooming cream sounds great as does any of the Cedarwood scent products! I would get the Citrus Scrub body wash for him to try first. Would love to try the cooling hydration lip balm. I would get the body wash/citrus scrub for my hubby. My husband wants to try their bodywash the most. I most want to try the deodorant | signature mint. I want to try the face scrub! i would want the face scrub in signature mint. I would like to try the deodorant | signature mint! I would love to try the deodorant for my hubby! I would like to get the body bars | cedarwood for my husband. The shave kit would be my husband's favorite but the skin clearing stuff would be cool too. Thanks for the giveaway...would like to try the Every Man Jack Body Wash, Citrus Scrub. This stuff is amazing and affordable. Will advise it to anyone! !